Intel has seemingly confirmed a number of 9th Generation Core processors. Several such processors were listed in the most recent microcode revision guidance document for the Spectre vulnerability. In the PDF document, dated 3rd July, the 9th gen processors are listed alongside Coffee Lake S (6+2) and Coffee Lake S (4+2) 8th gen processors. You can see the products highlighted in the screen shot below, courtesy of VideoCardz as the Intel microcode document has since been edited and re-uploaded. The lack of any Core-i7-9XXX chips in the document could indicate that they are likely to come in 8 core configurations. The document editor thus didn't accidentally add them to the microcode update PDF that has since been edited. Another premature publication error from Intel has been removed in the last few hours. The document was called the '8th Gen Core Family Spec Update' and the link is now dead. Luckily, again, VideoCardz has captured the evidence. This document shows more details of the above 9th gen Core processors. Details such as name, cache size, physical core count, graphics cores, frequencies and TDPs are all listed for the seven processors as bullet pointed above. 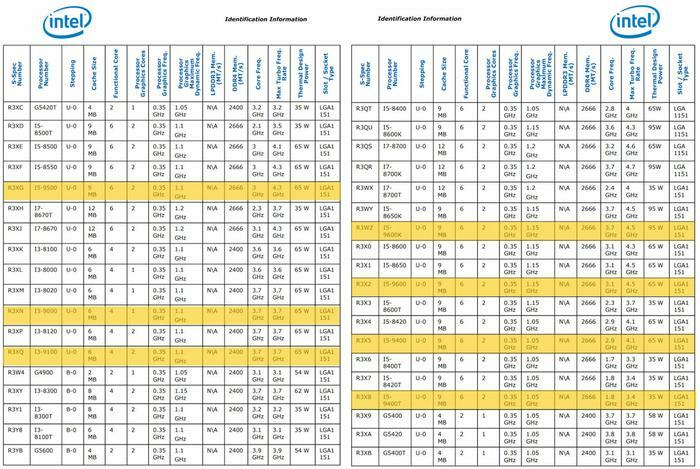 Picking through the data tables you can see that the 9th gen processors benefit from a frequency boost up to 200MHz in their Max Turbo state, while preserving 8th Gen successor's TDP. Again, there is a total lack of detail about 9th gen Intel Core i7 processors within the documents as seen. Yawn… Same architecture, higher TDP (8700k vs 9600k) and just smaller with extra cores. For an average user like me, I'll stick with my 6700K, still got more juice than I need anyway. No Hyper Threading/Logical Processor count, makes me think that they're not doing HT across all ranges like a lot of people have been hypothesising. Same arch, same cache, 14nm again? Slightly bumped clockspeeds and a TDP that still isn't accurate? The i5-8650/K are the weirdest pair on there. Same clockspeeds and TDP as the 9600/K. No spectre or meltdown mitigation then. I was half expecting a new socket. Also does this mean when/if 10nm arrives that it will be 10th gen, that's fortuitous.